- Heren golfschoenen, soepel leder en waterdicht. 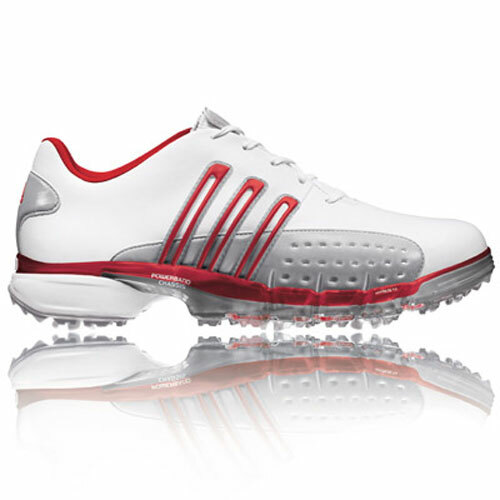 Created specifically to address the needs of the modern athlete, the Adidas Powerband golf shoe is engineered for today's power game.It incorporates three innovative Adidas Golf technologies that unite to harness untapped power by eliminating power leaks and promoting increased stability, balance and leverage. Powerband chassis. Unique, cradling TPU midsole frame creates tremendous perimeter support around the foot to promote ultra stability and power throughout your swing. FitFOAM. A visco-elastic foam engineered to mold to the exact contours of your foot, while evenly distributing weight and pressure for greater lateral stability and long wearing comfort. adiPRENE. A highly resilient material that maintains energy throughout your entire swing to promote improved footwork and better weight transfer. Gripzone. An integrated footbed surface that locks the bottom of your foot firmly in place, creating a single, solid unit between you and the shoe. 100% waterproof protection that surrounds the entire outside of the shoe.